With Doctor Strange topping the box office two weeks in a row, interest in Marvel’s sorcerer superhero is at an all-time high. 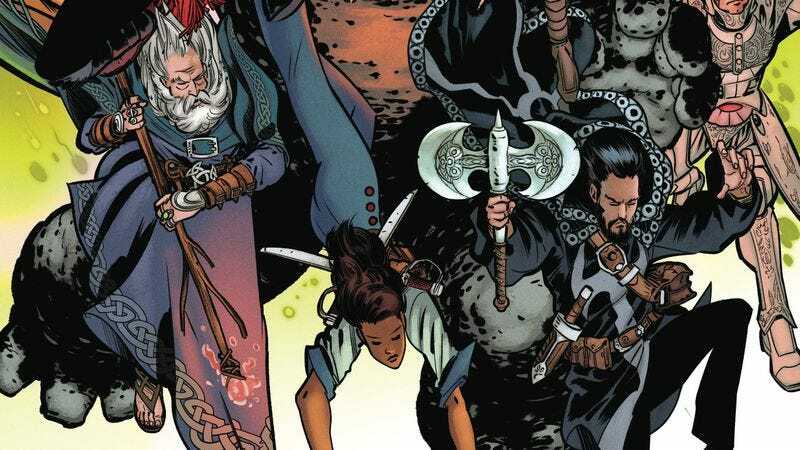 A new superhero movie means new comics spotlighting the central character, and while Marvel is taking it easy in terms of quantity, it’s not skimping on quality with the new Doctor Strange And The Sorcerers Supreme ongoing. Writer Robbie Thompson has done strong work with Spider-Man and assorted Spidey-adjacent heroes over the last couple years, but this new series has him upping his game to take full advantage of an outstanding art team. Building off of plot points from the main Doctor Strange ongoing, Sorcerers Supreme teams Dr. Stephen Strange with an assortment of Sorcerers Supreme pulled from different points in time to stop a new threat to magic, and the story has wasted little time jumping into the action. Artist Javier Rodriguez and inker Álvaro López have done fantastic work together on books like Daredevil, Axis: Hobgoblin, and Spider-Woman, and working on a book rooted in magic allows them to think outside the box when it comes to panel layouts and page design in Sorcerers Supreme. These preview pages of next week’s Doctor Strange And The Sorcerers Supreme #2 keep the compositions more traditional to maintain clarity for the fight sequence, but even then Rodriguez and López are finding interesting ways to amplify the action within that structure, like having Kushala send Nina flying at the reader in the same panel that shows Nina’s trajectory toward her hulking foe. There is a lot happening on these pages, and colorist Jordie Bellaire makes sure that nothing gets lost in the chaos with her vivid palette and textured rendering. The addition of a huge talent like Bellaire to this already exceptional art team is the most exciting thing about Sorcerers Supreme, and no matter what the story throws at them, they can be counted on to bring it to the page with drama, energy, and style.